You want October-appropriate? You got it! Why’s that? Because the quest continues! The quest for what, you ask? More Grampa Presents tapes, that’s what! See that image above? That’s the mark of greatness. You can’t deny it, because it is. Blood-drippin’ font, Al Lewis kinda sorta winking at you, greatness. Actually, the quest for these tapes never stopped. With last year’s big Halloween day post, I first spotlighted the Amvest Video “Grampa Presents” VHS series, in which Al Lewis (who was Grandpa Munster in everything but official name) hosted public domain horror films from a cheap, green-screened set and yelled at an unseen (and unheard) Igor. Despite that tape having the notable malady of ending before the movie was actually finished, I was entranced, and by January 2016, I had not only added a number of titles in the series to my collection, but also gained quite a bit of knowledge on the company, the series as a whole, etc. This was all presented on the blog via an intensely detailed review of The Corpse Vanishes from the line, a tape that has become one of the favorites of my collection (and that post is one of my favorites on this site, too). I’d like that Corpse Vanishes post to be the ultimate word on the subject, but that doesn’t mean my purchasing of these tapes or first-hand ‘research’ has stopped since. Oh no, I kept adding to the collection, kept learning about the various quirks of the line. Indeed, as far as pre-recorded VHS releases go, Grampa has become the main area of interest for me. That said, while I don’t want to reiterate all of the points I made in that last article, I feel I need to give a quick summation of just why I’m so fascinated by this whole thing. In short: the series had limited distribution, and has subsequently become relatively obscure. Despite a list of supposed releases, no one is quite sure just how many tapes actually made it out with Grampa adorning them in some fashion. Add to all that a cheap, budget tape charm and the aspect of horror hosting at the center of it all, and, well, is it any wonder I want as many of these as possible? And that brings us to this tape. In the realm of budget VHS (and Halloween! ), the charmingly cheap vibes emanating forth are nearly overpowering. I mean, you’ve got Al “Grampa” Lewis, presiding over one of the greatest horror films of all-time, the 1922 silent classic Nosferatu! The German expressionist (unauthorized) adaption of Dracula! How cool is that?! Now, this tape was not one of the “does it actually exist or not?” entries; its existence has been confirmed for quite some time, with a pic of the box floating around online to match. Still, the very thought of Grampa hosting one of my all-time favorite films, and a bonafide classic to boot, easily made it one of my personal chasers. It took awhile for it to show up online, but eventually it did, and duly became mine. It seems like this Nosferatu is one of the harder entries to come by, but then, even the more “common” titles don’t appear all that often. And, regardless of any perceived rarity on my part, these Grampa tapes seem to run on average $20-$30 no matter what the featured movie is. Sometimes even less. Look, I love these releases, warts and all, but aside from being compared to other old VHS tapes, they’re not really worth all that much. Is that because the line is so obscure? Because the tapes are so cheap in pretty much every facet? Or is it because I’m the only one that actually cares about all this? I don’t know the answers to these burning questions, but I do know that this Nosferatu VHS is mine and you can’t have it. So there! But, as I’ve also pointed out before, these covers are absolutely made by the “Grampa Presents” banner along the top. How could a horror fan not want to add that to their collection? They’re always so unabashedly cool, and they totally add a unique aspect to these releases. Why pick up that cheapo copy of Nosferatu when you can have this one with Al Lewis adorning it? It’s a decision that practically makes itself! Like the cover art, the synopsis’ found on the backs of these varied from release to release. Nosferatu got one of the more-detailed ones, though it’s kinda odd. 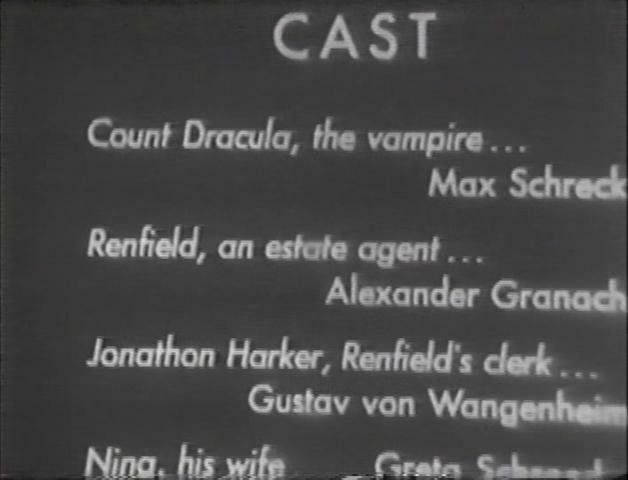 Nosferatu was, as previously mentioned, an unauthorized adaption of Bram Stoker’s Dracula. As such, the filmmakers originally changed names and details in hopes of avoiding a lawsuit from Stoker’s estate (a ploy that failed spectacularly; more on that in a bit). Later American prints later changed these aspects back to fit more with the Dracula we know and love. 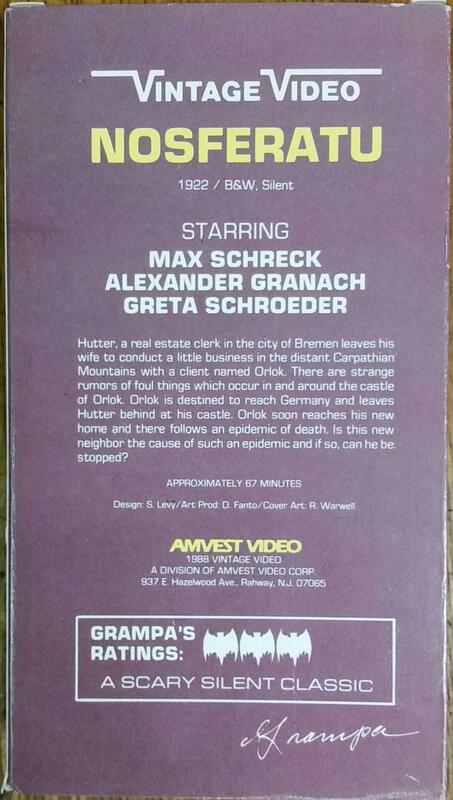 Perhaps surprisingly, the summary on the back cover uses the original naming system in its description (except for “Bremen,” which should be “Wisborg” in this instance), even though the actual print is a later Dracula-ized U.S. version that frequently made (and makes) the public domain rounds. So what point of reference was Amvest actually working from here? And the synopsis as a whole, it’s strangely ‘paced,’ for lack of a better term. Not only does it completely ignore the Dracula-aspects of the movie, but it also really focuses on only half the story. There’s too much emphasis on Hutter/Harker being stuck in the castle, and not enough on what the movie is really about. That said, even if I hadn’t known better, it still sounds like a pretty good movie. But, the bottom line is, it’s not a very balanced summary. ‘Course, like the banner on the front covers, the saving grace on the back covers was always the “Grampa’s Ratings” feature found at the bottom. They were like Al Lewis’ own stamp of approval, his personal guarantee of a good time. He always gave a short (sometimes very short) endorsement, and the piece de resistance, a star rating system – but composed entirely of bats. That’s fantastic. No joke, through whatever faults these tapes may exhibit, they have charm to spare. Though, only three bats? C’mon Gramps, if Nosferatu doesn’t deserve a whole four bats (or five, if that’s what his scale went up to), what does? At least he correctly concludes that it’s a “scary silent classic,” which it totally is. NosTeratu. From the same award-winning quality control that let a tape recorded in the wrong speed make it out the door. And yet, I can’t help but love the extreme budget tape vibes projected forth by said typo. Charm baby, charm. What? Oh, you’re confused by the fact that you’re not seeing any actual screenshots of Grampa in action? There’s a simple reason for that: Grampa is MIA on this tape. Okay, sure, the host segments for this line of tapes, they were the exact same for each movie; it’s not like I’m missing out on anything actually new to me here. 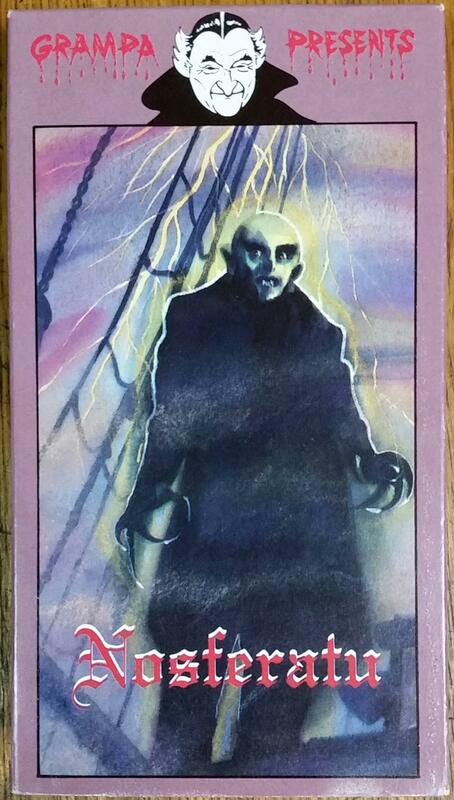 Still, their absence does take away an aspect of this VHS that would have made it stand as really unique when compared to other similar releases of Nosferatu. During my “journey” collecting as many tapes in this series as I can, I long ago discovered that certain releases, while appropriately displaying Lewis on the cover, do not actually feature him before and/or after the movie. (But on the flip side, a few releases don’t feature him on the cover at all, yet he is there when “Play” is pressed!) So, I knew that him not showing up to legitimately host this film was a distinct possibility. Just because I was forewarned doesn’t mean it didn’t hurt me deep anyway, though. Seeing how up-and-down a lot of these Amvest releases were/are, I don’t rule out the possibility that the Al Lewis segments DID show up on some copies of Nosferatu. I’m going to guess (and that’s all this is, a guess on my part) that later issues of these tapes neglected to include the Lewis segments. I have three SP-recorded tapes from the line, and none feature him. And, as far as the EP recorded ones go, this isn’t the only one I have that omits him, either. So, it wouldn’t really surprise me if other issues of the same title did have the Grampa bits. I guess what I’m getting at is that you just never really know until you actually play one of these. But, Grampa or no Grampa, Nosteratu Nosferatu is still Nosferatu. I mean, it doesn’t get much more classic than this! Plus, even with the Al Lewis host segments absent, his mere presence on the cover is enough to make Kino green with envy. 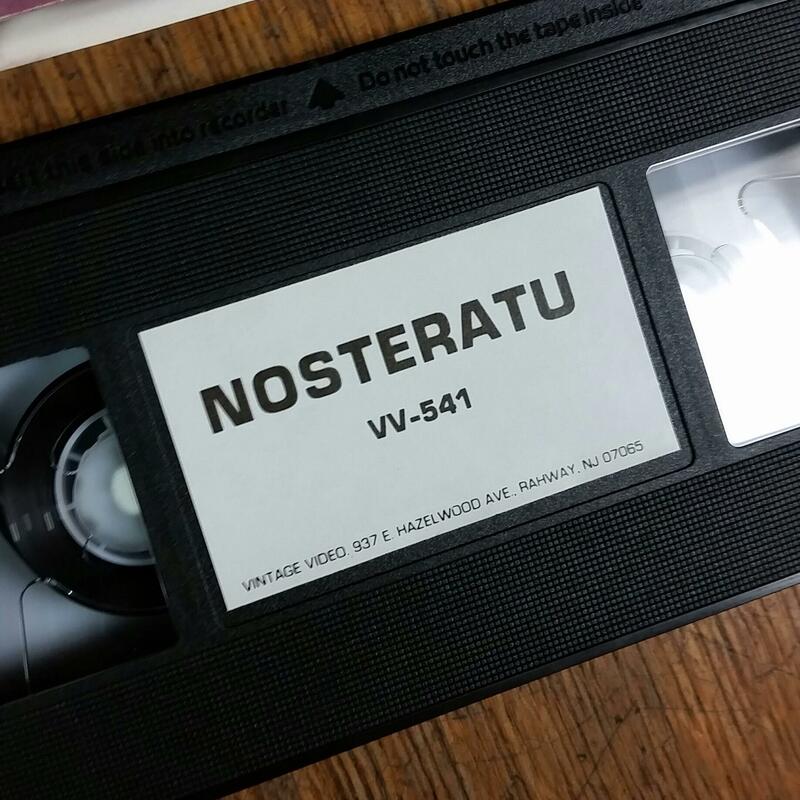 Oh sure, they can restore and tint and whatever this film as much as they want, the fact remains that none of their various VHS, DVD or Blu-ray releases of Nosferatu have Grampa Munster featured on the artwork, and thus, Amvest wins. Or do they? This ain’t exactly a Criterion-quality print of the film. Indeed, it’s borderline unwatchable, and that’s coming from a guy that spends a fair amount of time staring at thousand-year-old EP-recorded VHS tapes. First, the good news: this is basically the version of the film that introduced me to the movie waaay back in 1997. It was Halloween day, and I was in 5th grade. My grade school always did the whole costume thing, and at lunch we were allowed to go home to change. Now, I was already a young tape-head, and I had discovered our WAOH TV-29 and the variety of classic movies they ran that just-past Summer. Oddly enough though, it wasn’t until their late morning broadcast of Nosferatu on that fateful day that I recorded anything off the station. Already a big horror and sci-fi fan, and a sucker for silents too, I was pretty stoked to check out this new-to-me movie. So, lunchtime rolled around, my brother and I came home to get our costumes, and I had just enough time to see what I captured earlier that very day. Obviously I didn’t have time to watch the whole thing right then, but it took only a few cursory glances to know this was already ‘my’ movie. I was a fan from the start. It was an old, worn, Americanized print, one that I’d run into time and time again in the years following, but the thing that, unbeknownst to me initially, really set this one apart was a wonderfully spooky score (relatively spooky, anyway). I can’t think of a better way to describe this, but the “woooooo” sound made upon the opening credits starting, it instantly set the tone, and thus that’s just one of the reasons this is the version of the film I’m most nostalgic for. So, this Amvest release is essentially the same version I first saw that day back in October 1997. Well, except for the Thunderbird Films superimposition on the title screen (above), far worse print quality, and film duplication that’s markedly below what I myself recorded in EP back in ’97. I still find it wildly endearing, but man, my taped-off-TV copy from nearly 20 years ago (I refuse to believe it’s been that long!) is actually superior to this “real” release! Go figure! 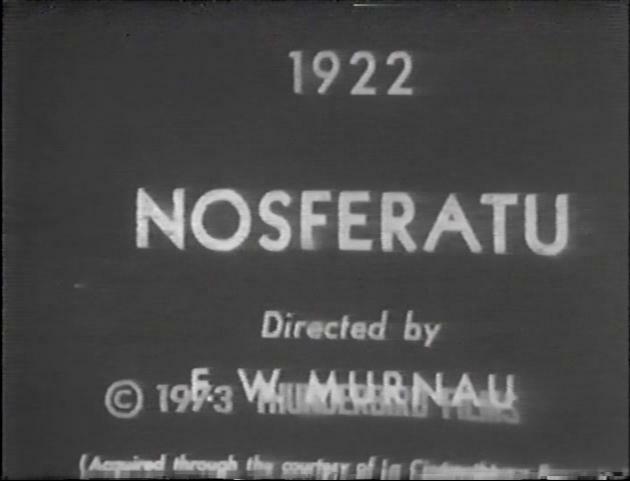 Nosferatu almost didn’t exist long enough for Grampa to (almost) host it. You know that lawsuit I mentioned earlier, the fear of which being the reason the names were changed in the first place? Yeah, that case was decided in the favor of Stoker’s widow anyway, and she immediately ordered that all prints be destroyed. Yikes! According to legend, she never even watched the film. Luckily, a few copies survived (foreign exports, if I recall correctly), and it’s those sources that gave us the film(s) we have today. Well, at some point, U.S. prints began removing “Orlock” and so on and instead utilizing the originally-changed names. Nosferatu was obviously already Dracula-ish, but this made it even more Dracula-ish (which makes sense, since it’s, you know, Dracula), and those are the versions most commonly (always?) found making the public domain rounds nowadays. Are the “re-revised” names found on this release true to the original film? Well, no. Purists will naturally balk at their inclusion here (and at a variety of other aspects, too). Still, because this is how I first saw the movie, I initially had a hard time fully getting into the restored versions that utilized the original ‘fake’ names. Doesn’t bother me now, but I still refer to Max Schreck’s vampire as “Dracula,” not “Orlock,” simply because that’s what it was to me first. A face? Nosferatu don’t need no face! 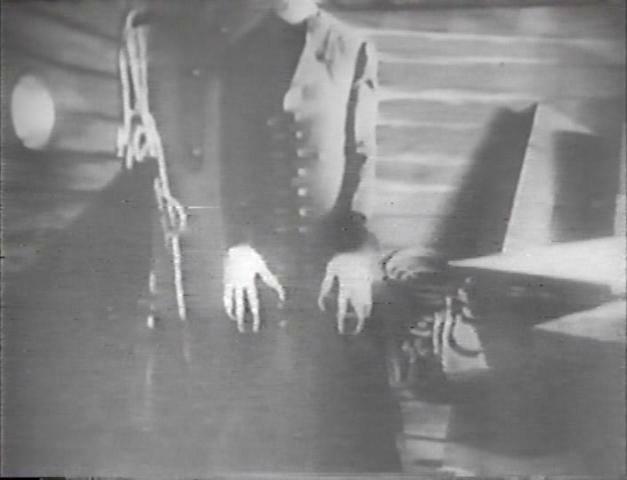 Look, we’re lucky to have any prints of Nosferatu at all, and naturally the ones we did end up with were copied endlessly in the years prior to this video release. Even the various Kino versions, fantastic though they are, aren’t exactly pristine. So, no one should ever think they’re going to get something particularly fantastic-lookin’ from a budget VHS edition. One recorded in EP, at that. As you can see above, there are shapes and forms on-screen, but actual detail is pretty much loooong gone. Now, most of that is the print itself, but Amvest, for as much as I love ’em, they get some of the blame here, too; their duplication techniques were apparently not the best. I’m not just talking the EP recording speed either, but rather the actual duplication. So many of these tapes look like they were duplicated using the old VCR-to-VCR method; maybe they were, I don’t know. Point is, when you’re using a trashed print of whatever, poor duplication is only going to make the final product look even worse. The poor condition of this print (and others like it), it’s understandable; I don’t think there was anything even approaching a ‘definitive’ Nosferatu until Kino released their terrific restoration in 1991. And, despite the poor quality here, you do get the gist of things. But man, sharper image quality makes a big difference in a film like this. On that front, I’ve got to backtrack a bit. I’ve previously stated that with films like this (and the original Night of the Living Dead, while we’re at it), you can clean them up and restore them all you want, the older, worn prints are the ones I find most effective. I don’t mind if a version uses the Dracula names, lacks tinting, is scratchy, whatever – to me, that only enhances the nightmarish quality. It almost feels more otherworldly, like you’re watching something you’re not supposed to. I know I’m in the minority here, and it undoubtedly has to do with how I first saw the movie, but hey, that’s just me. HOWEVER, I’ve got to rectify that statement somewhat; while I still stand by it, I stand by it only to an extent. This Nosferatu, it just looks bad. It’s blurry, the detail is blasted, and the picture is overly cropped. As such, much of the mood, not only is it NOT enhanced, it’s actually destroyed beyond repair. A head? Nosferatu don’t need no head! There’s that cropping I just mentioned! 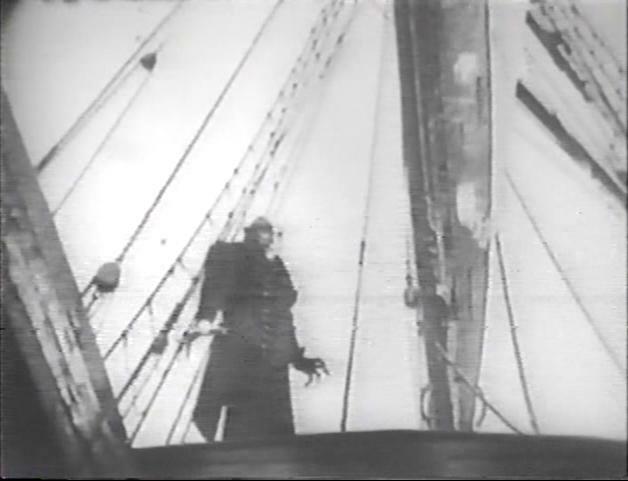 Nosferatu being cropped isn’t exactly a unique aspect to this release; many versions suffered varying degrees of cropping. Amvest’s Nosferatu though, boy, scenes like the one above (one of my favorites from the film) are not only rendered much less effective, they also look a bit goofy – and Nosferatu is anything but goofy. Abrupt gear shift; I should probably talk about the actual movie a little, huh? 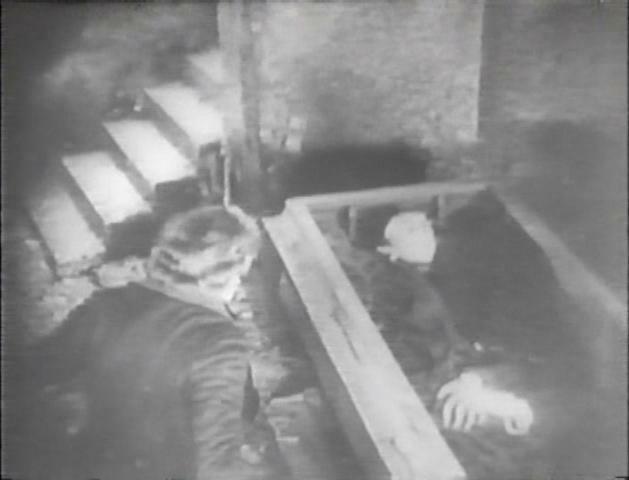 I have a feeling most people stumbling on to my silly little blog have already seen Nosferatu; it’s one of THE top horror films, silent or otherwise. But if, by chance, you haven’t seen Nosferatu, yet are familiar with Dracula (in some form or another), well, you’ll probably already have an idea of how this film plays out. The basics are same: a vampire travels from his faraway castle to civilization, bringing with him a thirst for blood, and thus, death. 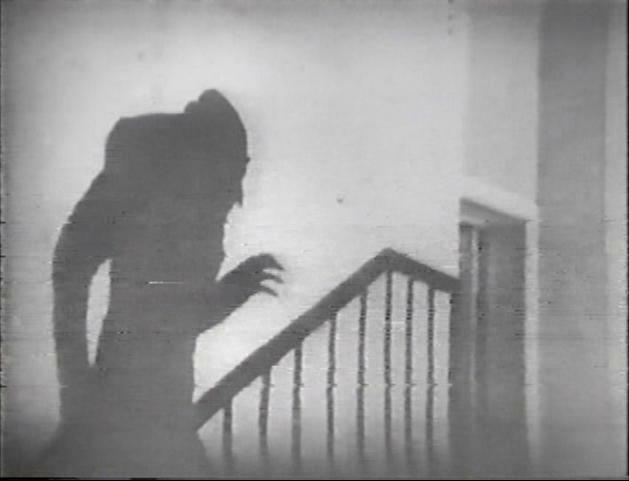 Look, Nosferatu is public domain. There’s no shortage of copies out there. My recommendation: head on over to Amazon and grab Kino’s fantastic restoration. If you haven’t seen the film, you need to see it. It’s a fantastic piece of German expressionism that, frankly, I’m not sure I can do justice to by merely explaining it. Look familiar? Why, that’s our cover art in action! You’ll note the absence of lightning. And why exactly is a vampire walking around in daylight? 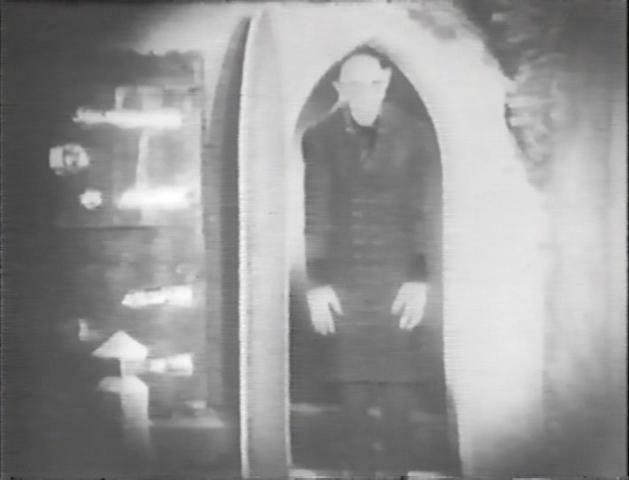 Nosferatu was originally tinted, with appropriate colors for appropriate times/scenes/etc. Restored versions included new, supposedly-accurate tinting, though that is, of course, not the case with the public domain copies such as this one. This is a tape where the whole is probably greater than the sum of its parts. While on one hand you’ve got a legitimately classic horror film as part of a cool series of tapes from the golden age of home video, you’ve also got a terrible print, problematic tracking, and what was supposed to be one of the most unique things about the whole deal, Grampa’s host segments, those aren’t even included. And yet, somehow, it still works. Don’t get me wrong, this is far, far from a definitive release of Nosferatu, but as an artifact of 1980s home video, it’s pretty darn cool. Maybe it’s because I’m a sucker for classic horror films, especially public domain ones that have found their way to the often-murky world of cheapie videotapes. At any rate, I couldn’t be happier to have this as part of my collection. Another Grampa tape down, _____ to go! This entry was posted in Uncategorized and tagged 1922, 1988, al lewis, al lewis amvest, al lewis vhs, amvest, amvest al lewis, amvest grampa, amvest grampa nosferatu, amvest munster, amvest nosferatu, amvest vhs, amvest video, budget tape, budget vhs, budget vhs release, dracula, film review, grampa, grampa munster, grandpa, grandpa munster, home video, horror host, horror host nosferatu, horror hosted, movie review, nosferatu, nosferatu 1922, nosferatu vhs, review, silent dracula, silent horror film, silent horror movie, silent nosferatu, silentmovie, super scary saturday, the munsters, vhs, vhs cassette, vhs release, vhs review, video, video cassette, video release, video tape, videotape, vintage vhs release, vintage video on October 10, 2016 by neovideohunter.